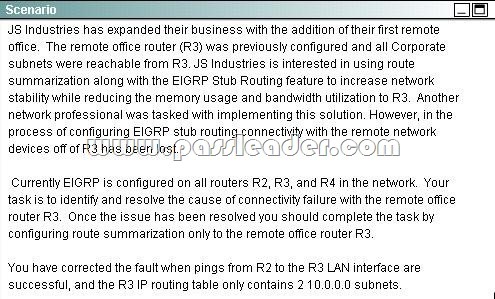 Now R3 will send updates containing its connected and summary routes to other routers. 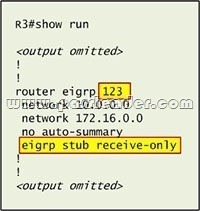 Notice that the eigrp stub command equals to the eigrp stub connected summary because the connected and summary options are enabled by default. Next we will configure router R3 so that it has only 2 subnets of 10.0.0.0 network. Use the show ip route command on R3 to view its routing table. Because we want the routing table of R3 only have 2 subnets so we have to summary sub-networks at the interface which is connected with R3, the s0/0 interface of R4. There is one interesting thing about the output of the show ip route shown above: the 10.2.3.0/24, which is a directly connected network of R3. We can‘t get rid of it in the routing table no matter what technique we use to summary the networks. 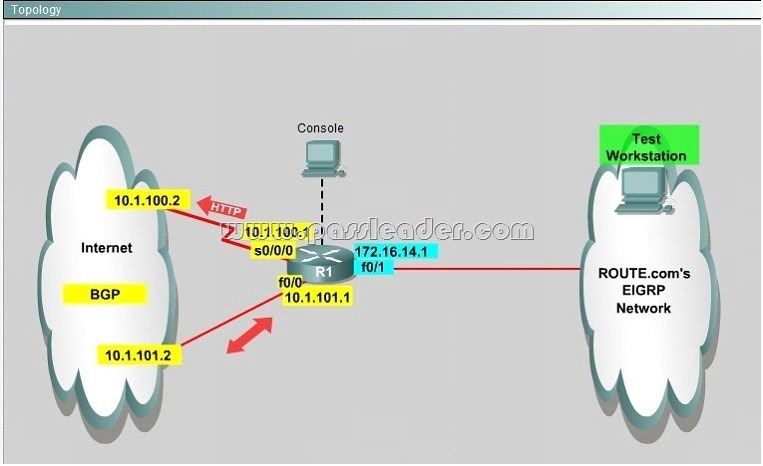 Therefore, to make the routing table of R3 has only 2 subnets we have to summary other subnets into one subnet. In the output if we don’t see the summary line (like 10.0.0.0/8 is a summary…) then we should use the command ip summary-address eigrp 123 10.2.0.0 255.255.0.0 so that all the ping can work well. 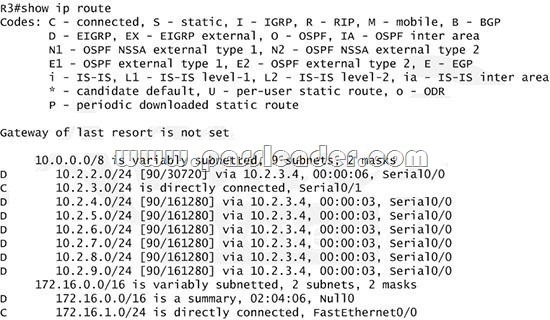 In conclusion, we will use the ip summary-address eigrp 123 10.2.0.0 255.255.0.0 at the interface s0/0 of R4 to summary. But in your real exam, if you don’t see the line “10.0.0.0/8 is a summary, …Null0” then you can summary using the network 10.2.0.0/16. This summarization is better because all the pings can work well. Finally, don’t forget to use the copy running-config startup-config command on routers R3 and R4 to save the configurations. Note: If you want to check the routing information, use the show ipv6 route command, not “show ip route”. You are a network engineer with ROUTE.com, a small IT company. ROUTE.com has two connections to the Internet; one via a frame relay link and one via an EoMPLS link. IT policy requires that all outbound HTTP traffic use the frame relay link when it is available. All other traffic may use either link. No static or default routing is allowed. Choose and configure the appropriate path selection feature to accomplish this task. You may use the Test Workstation to generate HTTP traffic to validate your solution. You are a network engineer with ROUTE.com, a small IT company. They have recently merged two organizations and now need to merge their networks as shown in the topology exhibit. 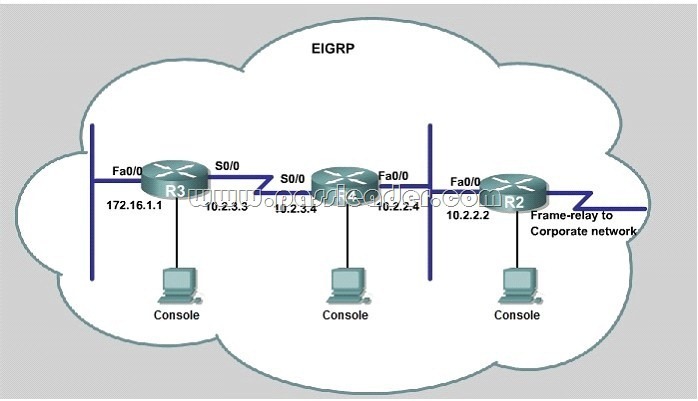 One network is using OSPF as its IGP and the other is using EIGRP as its IGP. R4 has been added to the existing OSPF network to provide the interconnect between the OSPF and EIGRP networks. Two links have been added that will provide redundancy. 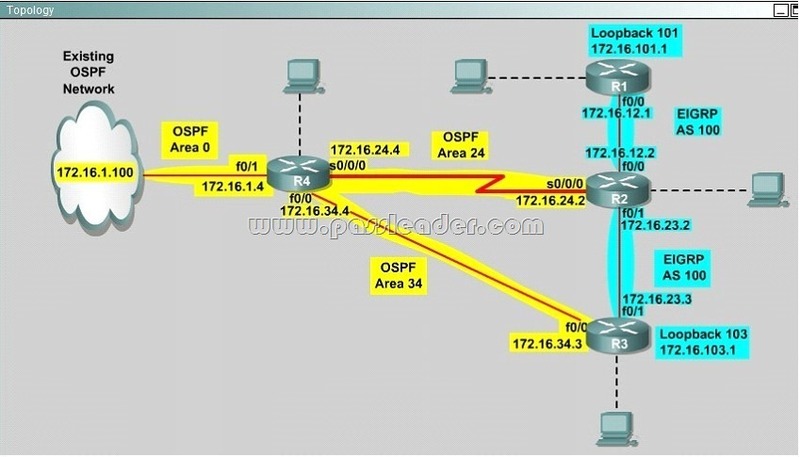 The network requirements state that you must be able to ping and telnet from loopback 101 on R1 to the OPSF domain test address of 172.16.1.100. All traffic must use the shortest path that provides the greatest bandwidth. 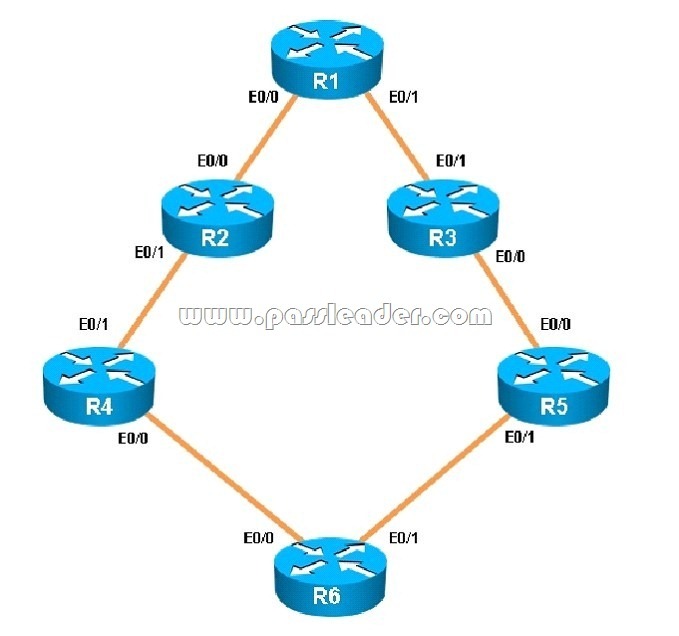 The redundant paths from the OSPF network to the EIGRP network must be available in case of a link failure. No static or default routing is allowed in either network. A previous network engineer has started the merger implementation and has successfully assigned and verified all IP addressing and basic IGP routing. You have been tasked with completing the implementation and ensuring that the network requirements are met. You may not remove or change any of the configuration commands currently on any of the routers. You may add new commands or change default values.